On Sunday, June 16, 2013, Boston Police Sexual Assault Unit Detectives arrested Patrick Barry, 21, of Boston in connection with two armed sexual assaults on women in the Mission Hill area of Boston. The Boston Police Department is asking community members who may recognize the individual seen in the enclosed photos to help identify him. 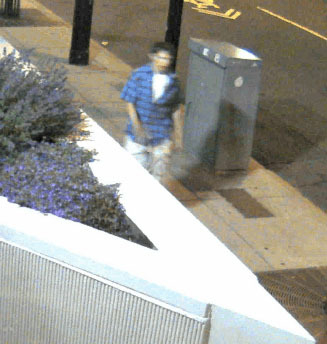 The individual seen in the pictures is wanted for questioning in connection to attempted sexual assaults which occurred in the Mission Hill area during the early morning hours of Saturday, June 15, 2013. The preliminary investigation indicates similarities in the two assaults and detectives are investigating the possibility that the assaults could be connected. In both incidents, victims were approached from behind and assaulted with a knife. Incident #1: At about 2:00am, on Saturday, June 15, 2013, officers from District B-2 (Roxbury) responded to a call for a person stabbed in the area of Vancouver Street and Huntington Avenue. On arrival, officers spoke with female victim who stated that she was walking home when she was attacked from behind. According to the victim, the suspect jumped out of the bushes, grabbed her and attempted to sexually assault her but she was able to fight him off. The female sustained a non-life threatening stab wound to her leg. 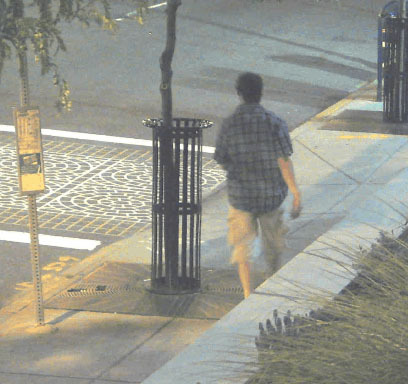 The suspect is described as a white male in his twenties, blonde or brownish hair, 6’0” in height, wearing a blue plaid shirt and khaki shorts. Incident #2: Less than an hour later, at approximately 2:51am, officers from District B-2 (Roxbury) responded to a second call for a person stabbed in the area of Huntington Avenue and Parker Hill Avenue. On arrival, officers spoke with a female victim who reported she was grabbed from behind and knocked to the ground by an unknown suspect. The victim sustained a non-life threatening stab wound to her hand but was able to escape. The suspect is described as a white male, in his early twenties, brownish wavy hair, between 5’7” to 6’0” in height, wearing a white or grey hoodie and blue jeans. The Boston Police Department is actively investigating facts and circumstances surrounding both incidents. Anyone with information is asked to call District 2 (Roxbury) detectives at 617-343-4275 or Sexual Assault Unit at 617-343-4400.